It is hard to describe the feelings that one experiences walking onto a stage in front of an arena full of 10,000 men. As I took my seat on the stage next to my co-author Billy Mauldin and NASCAR Hall-of-Famer Darrell Waltrip and glanced across the packed arena the first thought that crossed my mind was ‘wow‘. While undoubtedly most of the men in the audience were in their seats to hear from a NASCAR legend; I was there too. For a window of time I had a huge platform, and people were listening. We found ourselves on this stage amidst a campaign to promote our then new book, The Race: Living Life on Track with Darrell Waltrip. 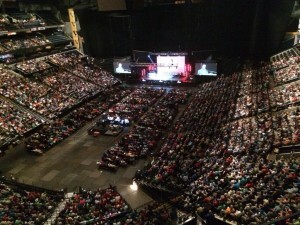 Along the way we had some radio and media coverage, but the invitation to share at #MainEvent14 by LifeWay Men was certainly our largest opportunity. #MainEvent14 was highlighted with an opening keynote from Former President George W. Bush and included talks with Army Ranger Jeff Struecker and famed coach Tommy Bowden. It was no small ‘thing’ to find ourselves invited to share the stage with these renowned legends. I mean seriously, how many people can say that Former President George W. Busch was their opening act? Following our time on stage we were invited to the concourse to sign copies of our book. The autograph line wrapped the entire interior of the Bridgestone Arena and we sold out of books in under ten minutes. As I stood next to DW signing copies of our book I was grinning from ear-to-ear, soaking it all in. I will admit, many in the autograph line would have DW sign their book and attempt to slip by quickly so I wouldn’t ‘defile’ it with my signature too. I did my part to quickly snag and sign as many copies as possible before I could be told no! After the book signing I logged into Twitter, and there it was in all of it’s shining glory. Someone had quoted me on Twitter. And not just one person, but several. I felt I had arrived. For a few hours in time I was a ‘Christian Celebrity’ to 10,000 people. It was one of the most dangerous games of ‘Russian Roulette’ that I ever played. The entire day was full of fun moments, from green rooms (that aren’t very green) to hospitality packages and opportunities to meet some heroes of the faith. It was truly a unique and exciting experience. Yet as I walked through the day I wrestled with the temptation of getting ‘addicted’ to this feeling. It was all so very, very addicting. As people who were created for relationship, to be adored by others is a very desirable thing. Jesus told the lawyer that one of the greatest commands is to love others as we love ourselves; I believe that is because at everyone’s core is the desire to be loved. Why would it be important to love others if others didn’t long to be loved? When we are honest with ourselves we, too, recognize our desire to be loved. In our desire to be loved it is easy to find our identity wrapped up in how many people love us or follow us. When we begin to find our identity in others we begin to lose our identity in Christ. Gaining the applause of man becomes more important than gaining the applause of Jesus. Let me take pause and clarify, I feel there is a very distinct difference between a celebrity who is a Christian and a ‘Christian celebrity’. The first takes the platform that someone has and utilizes it to make their story about Christ. The latter takes Christ’s story and leverages it to make the story about them. The danger of becoming a ‘Christian celebrity’ is that it has the potential to turn the story away from Christ and towards ourselves. When we take the ‘Christian celebrity’ bait; we begin to live and act like the story is about us. We prioritize growing our own platform and increasing our own following justifying ourselves with the logic that ‘growing our platform just expands God’s reach‘ or ‘becoming famous just gives me an opportunity to make Jesus famous‘. We fail to see that it is completely converse to the ministry of Jesus. The story of Jesus just becomes a way to leverage more people to follow us. The lure goes beyond ‘celebrity’. Personal relationships can hold the same intrigue. People become trading cards that we own; collecting associations with the prominent and important and holding them dear to us as if those relationships make us more important. Sometimes we hold onto them for leverage, and sometimes for worth. We protect those relationships at all costs. We are filled with envy when we see others try to form relationships with those we ‘own’. We play those relationships like poker cards to boost ourselves. Connecting others with ourselves becomes more important than connecting others with Jesus. The gospel becomes about our gain rather than God’s grace. We look to see how it can benefit ‘me’ rather than ‘we’. There was that time when James and John’s mom came to Jesus wanting her son’s to sit at His right and at His left. They were seeking after all of the ‘perks’ of the Kingdom.After Jesus set them straight on what they were after, He gave His disciples a stirring reminder that whoever was to become great was to be a servant; that to be first you had to be last. He then reminded His disciples that He didn’t come to be served, rather to serve. Jesus didn’t come for the trappings of fame and status; the relationships and perks that come along with prestige. He came to serve. Jesus didn’t need a platform to make Himself famous, His teachings and servanthood would draw people to God. Did a lot of people follow Jesus? Indeed they did; but I encourage us all to look at how He handled and reacted to the crowds. Jesus often withdrew from them for alone time with his Father or with the disciples. So if Jesus didn’t come to build a platform, why do we think that building a platform to make Him famous is a good idea? Why do we think that becoming a ‘celebrity’ in the faith is the right plan? Jesus didn’t ask us to be His PR team, He just told us to simply go and make disciples. To love. To serve. There are those throughout history who have become known and famous by their faith. Men who were so fixed on Jesus that they contributed amazing reform, change and teachings to the Christian faith and church. Yet being known was never their goal; knowing Jesus was their pursuit. Their goal wasn’t becoming famous or known by others; their goal was being known by Jesus, and pointing others that way too. Paul came simply and humbly. His wasn’t into rising to a level of ‘Christian celebrity’ in the early church; he recognized that didn’t work in drawing people to Jesus. Only Jesus Christ and him crucified could draw people in. As I walked through the excitement of the day it would have been very easy for me to have come out of the event headstrong and dead-set on replicating the experiences I just had. I could have very easily come out of the event bent on becoming ‘the next big thing in Christianity’. Only by the strength and grace of God, I didn’t. We will all encounter opportunities to make Jesus’ story about ourselves rather than Him. Opportunities to use the gospel to boost ourselves; to experience fame and gain. May we always take pause to remember we aren’t building our Kingdom; we are helping establish God’s. 5 For what we preach is not ourselves, but Jesus Christ as Lord, and ourselves as your servants for Jesus’ sake. 6 For God, who said, “Let light shine out of darkness,”made his light shine in our hearts to give us the light of the knowledge of God’s glory displayed in the face of Christ.